Preheat oven to 350-400°, depending on size of pieces. Lightly oil large baking sheet. Rinse and pat dry about 4 lb. chicken parts. My favorite is turkey thighs—the other chicken. Combine in a bowl with dijon mustard to lightly coat (about 1/3 to 1/2 cup). 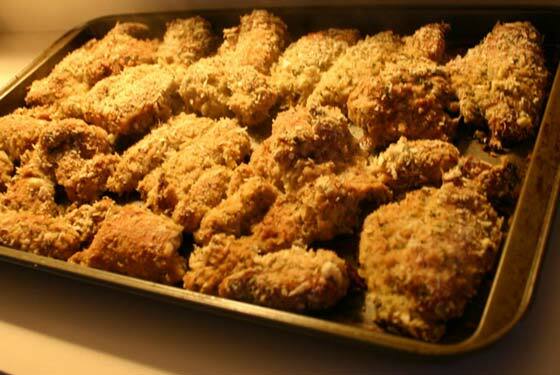 Coat each piece of chicken with the crumb mixture, patting to make more stick. Arrange coated pieces on baking sheet; avoid having pieces touch. Bake 35-60 minutes or until done.